Tallinn ( ) is the capital and largest city of Estonia. Tallinn occupies an area of 159.2 km2 (61.5 sq mi) and has a population of 435,245. It is situated on the northern coast of the country, on the shore of the Gulf of Finland, 80 km (50 mi) south of Helsinki, east of Stockholm and west of Saint Petersburg. Tallinns Old Town is listed as a UNESCO World Heritage Site. It is ranked as a global city and has been listed among the top 10 digital cities in the world. The city was a European Capital of Culture for 2011, along with Turku in Finland. The city was known as Reval from the 13th century until 1917 and again during the Nazi occupation of Estonia from 1941 to 1944. Approximately 32% of Estonias total population lives in Tallinn. The first traces of human settlement found in Tallinns city center by archeologists are about 5000 years old. The comb ceramic pottery found on the site dates to about 3000 BC and corded ware pottery c. 2500 BC. In 1050 the first fortress was built on Tallinn Toompea. As an important port for trade between Russia and Scandinavia, it became a target for the expansion of the Teutonic Knights and the Kingdom of Denmark during the period of Northern Crusades in the beginning of the 13th century when Christianity was forcibly imposed on the local population. Danish rule of Tallinn and Northern Estonia started in 1219. In 1285 the city, then known as Reval, became the northernmost member of the Hanseatic League – a mercantile and military alliance of German-dominated cities in Northern Europe. The Danes sold Reval along with their other land possessions in northern Estonia to the Teutonic Knights in 1346. Medieval Reval enjoyed a strategic position at the crossroads of trade between Western and Northern Europe and Russia. The city, with a population of 8,000, was very well fortified with city walls and 66 defence towers. A weather vane, the figure of an old warrior called Old Thomas, was put on top of the spire of the Tallinn Town Hall in 1530 that became the symbol for the city. With the start of the Protestant Reformation the German influence became even stronger as the city was converted to Lutheranism. In 1561 Reval politically became a dominion of Sweden. During the Great Northern War, plague stricken Tallinn along with Swedish Estonia and Livonia capitulated to Imperial Russia in 1710, but the local self-government institutions (Magistracy of Reval and Chivalry of Estonia) retained their cultural and economical autonomy within Imperial Russia as the Governorate of Estonia. The Magistracy of Reval was abolished in 1889. The 19th century brought industrialization of the city and the port kept its importance. During the last decades of the century Russification measures became stronger. On 24 February 1918, the Independence Manifesto was proclaimed in Reval, soon to be Tallinn, followed by Imperial German occupation and a war of independence with Russia. On 2 February 1920, the Tartu Peace Treaty was signed with Soviet Russia, wherein Russia acknowledged the independence of the Estonian Republic. Tallinn became the capital of an independent Estonia. After World War II started, Estonia was annexed by the Soviet Union (USSR) in 1940, and later occupied by Nazi Germany from 1941 to 1944. After the Nazi retreat in 1944, it was again annexed by the USSR. After annexation into the Soviet Union, Tallinn became the capital of the Estonian SSR. During the 1980 Summer Olympics, the sailing (then known as yachting) events were held at Pirita, north-east of central Tallinn. Many buildings, such as the "Olümpia" hotel, the new Main Post Office building, and the Regatta Centre, were built for the Olympics. In August 1991 an independent democratic Estonian state was re-established and a period of quick development to a modern European capital ensued. 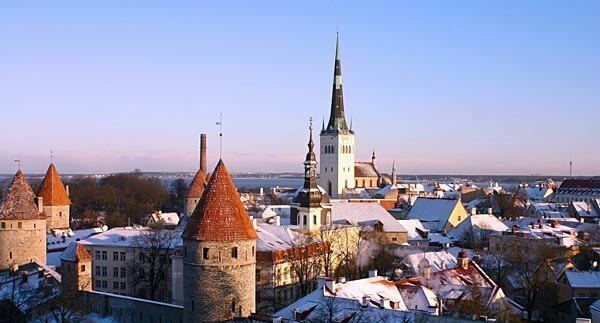 Tallinn became the capital of a de facto independent country once again on 20 August 1991. The Toompea (Domberg) or "Cathedral Hill", which was the seat of the central authority: first the Danish captains, then the komturs of the Teutonic Order, and Swedish and Russian governors. It was until 1877 a separate town (Dom zu Reval), the residence of the aristocracy; it is today the seat of the Estonian parliament, government and some embassies and residencies. The Old Town, which is the old Hanseatic town, the "city of the citizens", was not administratively united with Cathedral Hill until the late 19th century. It was the centre of the medieval trade on which it grew prosperous. The Estonian town forms a crescent to the south of the Old Town, where the Estonians came to settle. It was not until the mid-19th century that ethnic Estonians replaced the local Baltic Germans as the majority among the residents of Tallinn. The city of Tallinn has never been razed and pillaged; that was the fate of Tartu, the university town 200 km (124 mi) south, which was pillaged in 1397 by the Teutonic Order. Around 1524 Catholic churches in many towns in Estonia, including Tallinn, were pillaged as part of the Reformational fervor: this occurred throughout Europe. Although extensively bombed by Soviet air forces during the later stages of World War II, much of the medieval Old Town still retains its charm. The Tallinn Old Town (including Toompea) became a UNESCO World Cultural Heritage site in 1997. At the end of the 15th century a new 159 m (521.65 ft) high Gothic spire was built for St. Olafs Church. Between 1549 and 1625 it may have been the tallest building in the world. After several fires and following rebuilding, its overall height is now 123 m (403.54 ft). 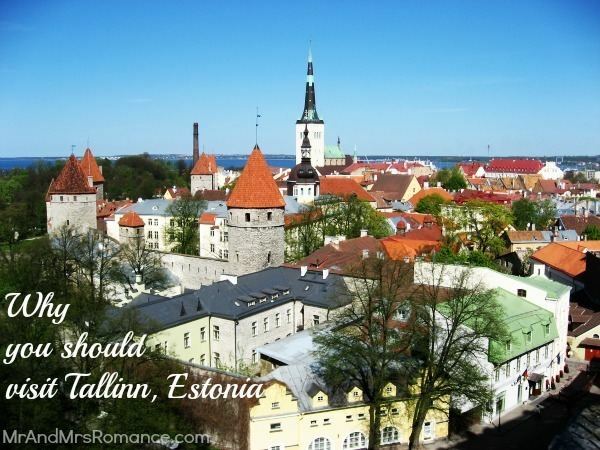 Tallinn is situated on the southern coast of the Gulf of Finland, in north-western Estonia. The largest lake in Tallinn is Lake Ülemiste (9.44 km2 (3.6 sq mi)). It is the main source of the citys drinking water. Lake Harku is the second largest lake within the borders of Tallinn and its area is 1.6 square kilometres (0.6 sq mi). Tallinn does not lie on a major river. The only significant river in Tallinn is Pirita River in Pirita, a city district counted as a suburb. Historically, the small Härjapea River flowed from Lake Ülemiste through the town into the sea, but the river was diverted for sewage in the 1930s and has since completely disappeared from the cityscape. References to it still remain in the street names Jõe (from Jõgi, river) and Kivisilla (from Kivisild, stone bridge). A limestone cliff runs through the city. It can be seen at Toompea, Lasnamäe and Astangu. However, Toompea is not a part of the cliff, but a separate hill. The highest point in Tallinn, at 64 meters above sea level, is situated in Hiiu, Nõmme District, in the south-west of the city. The length of the coast is 46 kilometres (29 miles). It comprises three bigger peninsulas: Kopli peninsula, Paljassaare peninsula and Kakumäe peninsula. Tallinn is the financial and business capital of Estonia. The city benefits from the high level of economic freedom, liberal economic policy and has a highly diversified economy with particular strengths in information technology, tourism and logistics. Daily Mail called Tallinn one of worlds seven smartest cities. 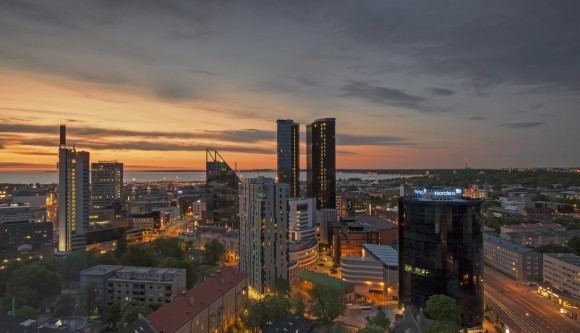 Currently, over half of the Estonian GDP is created in Tallinn. In 2008, the GDP per capita of Tallinn stood at 172% of the Estonian average. What can arguably be considered to be Tallinns main attractions are located in the old town of Tallinn (divided into a "lower town" and Toompea hill) which is easily explored on foot. The eastern parts of the city, notably Pirita (with Pirita Convent) and Kadriorg (with Kadriorg Palace) districts, are also popular destinations, and the Estonian Open Air Museum in Rocca al Mare, west of the city, preserves aspects of Estonian rural culture and architecture.